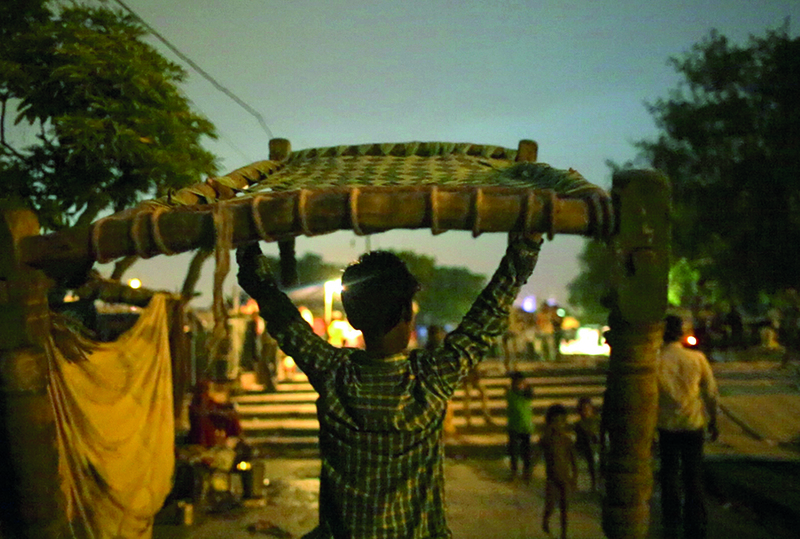 The film takes us into a heady world of insurgent sleepers’ communities as well as the infamous ‘sleep mafia’ in Delhi where just securing a safe sleeping spot often becomes a question of life and death for a large number of people. The film trails the lives of two individuals, Shakeel and Ranjeet. Shakeel, a renegade homeless sleeper has for the last 7 years slept in a diverse range of improvised places like subways, under park benches, parking lots, abandoned cars and lately, at areas controlled by the sleep mafia. The film follows his attempts to secure a safe sleeping space just around the time the infamous winter rains of Delhi are due. Ranjeet runs the ‘sleep-cinema’ community in Loha Pul in Delhi, a huge double-story iron bridge straddling the banks of the river Yamuna. A thin strip of land under Loha Pul houses shanty cinemas, where over 400 odd homeless come and sleep through the day for a nominal price. The flooding of the river Yamuna poses a threat to the people sleeping there every monsoon. The film looks at not only the tremendous social and political pressure that sleep exerts on the homeless in the city, but is also a philosophical exploration of sleep at large.